The 16th RAI Film Festival 2019 will open with the screening of President’s Award winner EDGE OF THE KNIFE (SGAAWAAY K’UUNA), by Gwaai Edenshaw and Helen Haig-Brown. 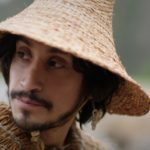 Edge of the Knife is the first feature film in the endangered Haida language, spoken in the Haida Gwaii archipelago off the coast of Canada and on Prince of Wales Island in Alaska. The film is a historical tale based on Haida oral story-telling and mythology. Having survived decades of hardship and cultural genocide, Haida today are reclaiming their language with hard work and dedication. The film is part of thriving cultural and language revitalisation programme; fluent elders carefully translated the script into three Haida dialects and dedicated fluent speakers trained the fully-Haida cast in memorizing, pronouncing, and expressing their lines. GWAAI EDENSHAW is a contemporary Haida artist, pole carver and story teller. He uses gifts inherited from his people to explore ongoing narratives and the intersection of stories, language, politics, and aesthetics. HELEN HAIG-BROWN is an award-winning Tsilhqot’in filmmaker. Her diverse body of work includes the 2009 short film “?E?Anx (The Cave)”, Official Selection at the 2011 Sundance Film Festival and 2014 feature documentary “My Legacy” (2014), winner of best documentary at 2014 imagineNATIVE Media & Arts Festival. First introduced in 2017, the President’s Award is assigned by the RAI Film Festival Committee to a film of truly exceptional merit that addresses issues of great contemporary importance and concern in anthropology or archaeology. This film may take the form of either fiction or fact-based documentary, and need not necessarily belong to any conventional ethnographic genre. The screening and award ceremony will take place on Wednesday 27 March 2019, 6-8PM, Cinema 1, Watershed, 1 Canons Road, Harbourside, Bristol BS1 5TX.